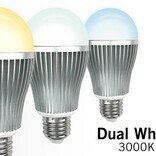 Dual White Wifi LED bulb with 9Watt LED. Dimmable, white shade configurable from warm white to daylight. Controllable by the optional Wifi Box with APP or by the 4-channel remote. The ideal bulb replacement with unprecedented ease. 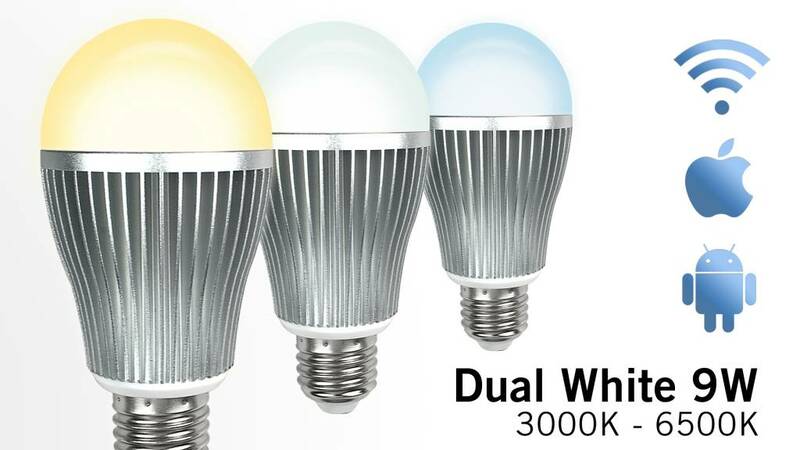 In addition to its wireless convenience, this bright Wifi and Wireless operated dimmable LED bulb can also dim and mix two shades of white! From cozy warm white for the evening to sparkling daylight, and everything in between. Together with the Wifi Box this LED lamp is fully controllable by the APP on your smartphone or tablet. But you can also (or solely) use a 4-channel remote control. With a consumption of only 9 Watt you get the light performance from a conventional 75 watt bulb while saving up to 80% energy. The Wifi LED lamps also have a life expectancy of 50,000 hours or up to 25 years of shining joy!